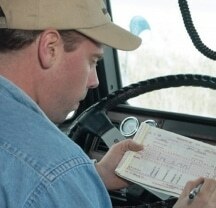 State and federal regulations dictate the number of hours a driver can legally operate a truck. Many trucking accidents are the result of driver fatigue and failure to comply with those state and federal regulations. The driver’s logs are used as evidence in determining whether a driver was in violation of these state and federal laws. State and federal regulations dictate the number of hours a driver can legally operate a truck. Many trucking accidents are the result of driver fatigue and failure to comply with those state and federal regulations. The driver’s logs are used as evidence in determining whether a driver was in violation of these state and federal laws. Black box and GPS systems today often track the actual number of miles and stops that a truck has made. Aggressive investigation by our experienced truck accident attorneys obtain and compare this information with the driver’s log. This must be done to ensure that the driver’s log has not been fraudulently falsified. Our attorneys will work hard to preserve and locate the evidence that will be necessary to the prosecution of your claim. In 2003, the federal Motor Vehicle Carrier Safety Administration instituted new hours of service regulations to help reduce the number of accidents caused by driver fatigue. Although the new regulations have helped reduce the number of accidents involving trucks, the U.S. National Transportation Board cites driver fatigue as a factor in 20% to 40% of truck accidents. The law offices of Brown Chiari, LLP has been working for over 20 years to represent truck and auto accident victims seek the compensation they deserve. Contact us today.